Right now, my house smells amazing. Wafts of cinnamon, nutmeg, clove and pumpkin are making their way to my office from the kitchen. Nope, not pumpkin pie this time. 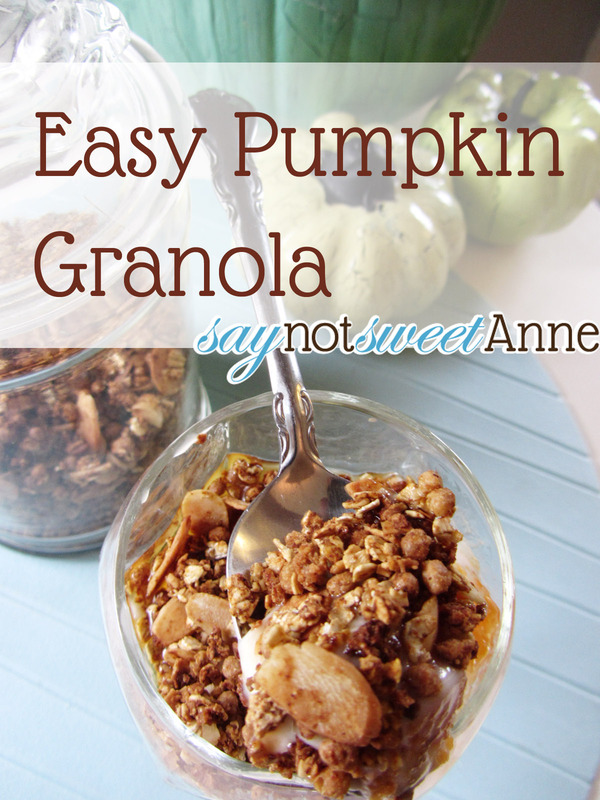 I’ve tried my hand at Pumpkin granola. 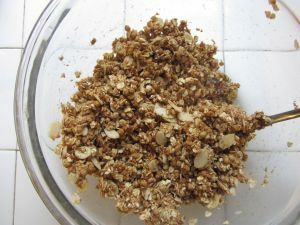 Additionally, I’ve been really into home made granola lately. I’m able to pick the exact grains that I want to include for protein, fiber and other dietary considerations. Plus, I’m able to add nuts that I favor and control the level of sweetness. 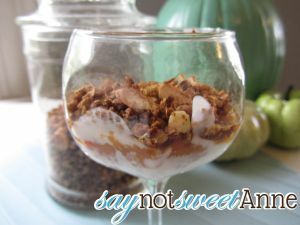 For me, a chilled cup of low fat vanilla yogurt and a spoonful of home made granola is just the thing for a snack, lunch, or dessert. Another reason I’ve made this granola over making a pie- I can put this in a jar with a cute label and give it away! The recipient (teacher, coworker or friend) will find all the smells and flavors that make us thing of fall and the early winter holidays. Its a win win! Oh, and this isn’t where it all ends. 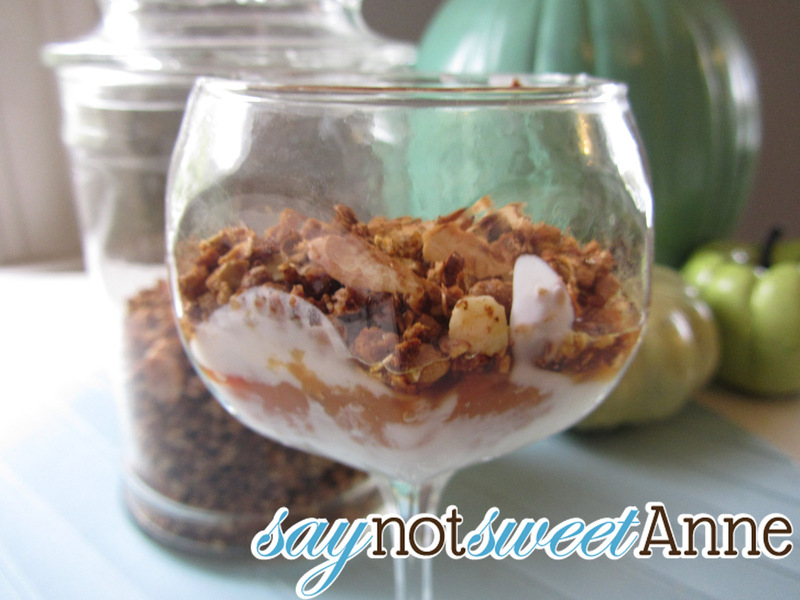 This granola inspired my latest invention- a DIY Lunchable JAR! Combine the almonds, oats, flax, and bran in a large bowl. Set aside. 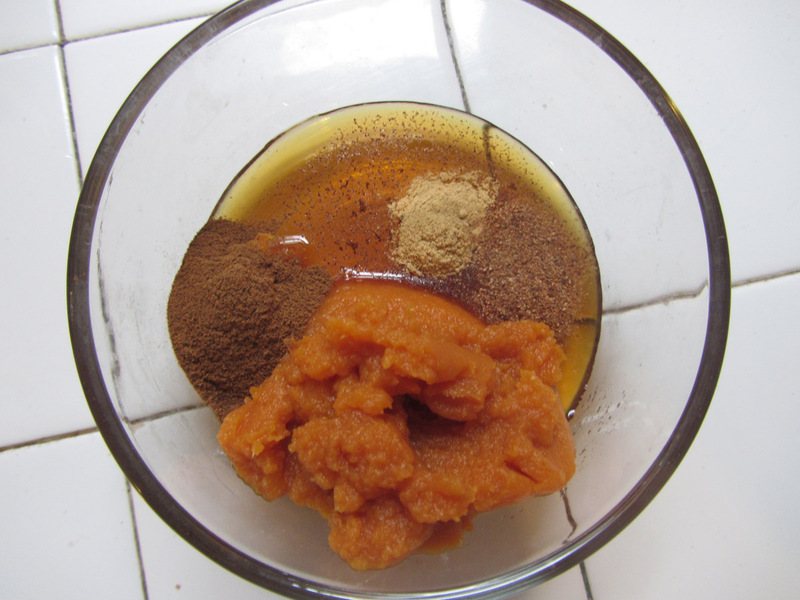 In a smaller bowl, combine the pumpkin, syrup and spices. Mix until well combined. 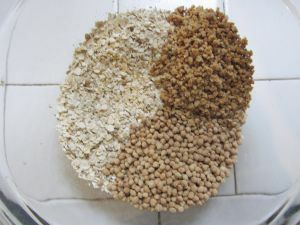 Pour the wet mix into the dry mix, and stir until all seeds, oats, etc are covered in the wet mixture. It should be sticky, but not wet. 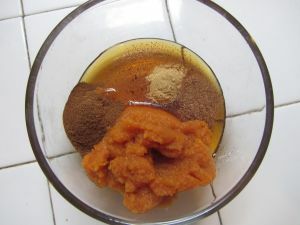 Spread mixture onto a baking dish in a shallow layer. Bake at 350 stirring every 5 minutes until golden and toasted. Let cool on baking sheet until room temp. Then, crumble into an air tight jar and seal! I like to serve mine with layers of yogurt, pumpkin puree and maple syrup. Nice flavour combination. Thank you for sharing this recipe. So Yummy! I hope you will share this at The CSI Project this week. The challenge is Fall Food and this is perfect. You just might win! Links ups begin Wednesday night! Each day we feature a fall recipe so come on over! Sounds so yummy with the pumpkin! Thanks so much for sharing on Busy Monday! Stopping by from the Marvelous Mondays link up – love your post! I’d love for you to add this to the Pumpkin Patch Hop, too! Ooo, I’ve never seen a granola recipe quite like this. Sounds yum. So going to pin and try. I’d love to have you link this up to Titus 2 Tuesday on Cornerstone Confessions too. Hope to see you there. This sounds so good — have to give this a try! Are you using ground flax — I’m guessing from the photo?? So what is the total approx baking time? Do I need to schedule an hour for stirring?? Fifteen minutes?? Thanks…it’s in the oven now, and smells GREAT.